„How do you buy stuff without cash?“ – a valid question that can also be understood from a different perspective. 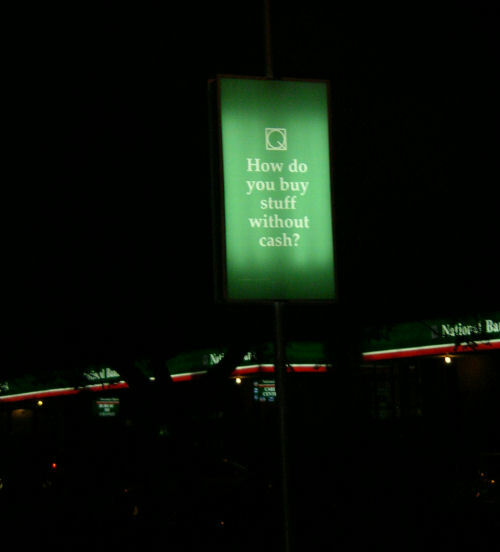 While the average middle-class Nairobian would probably associate this question with the convenience of pesa points a.k.a. functioning ATMs, others might just as well think of huge Nakumatt supermarkets that offer virtually anything and – to my mind – are part of the driving forces that direct the Kenyan economy. People seem to have money and are willing to share spend it – which of course isn’t bad. Lakini, I was wondering what kind of impact the Nakumatt & Co. variety has on those that see it everyday and can’t afford it. Just yesterday I encountered an old Gikuyu grandmother from Githongoro (sp?) who’s trying to feed her 40years old mentally disabled son and who had never come accross any sort of water flushed toilet nor light switches. A nice old, very humble cucu (grandmother) who’s just as Kenyan as those Playstation Kids, the mobile phone generation. We are talking of Nation building and I can’t see many ppl taking care of others – only working for their own benefit or interest. What’s more important – money or the joy of sharing? 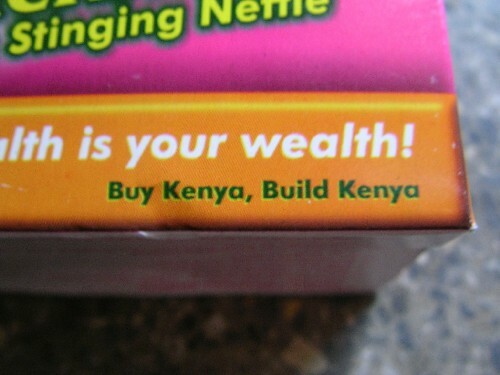 Harambee, harambee? 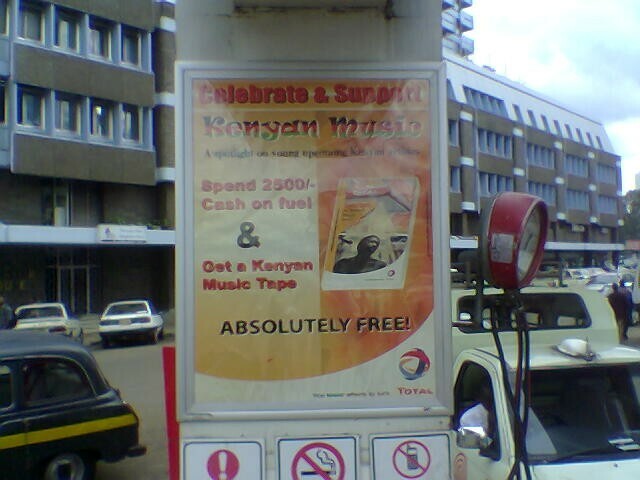 An advertisement by TOTAL Kenya Ltd. on “a free tape of Kenyan music with every 2.500/= spent cash on fuel”….modern nationalism = marketing instrument? 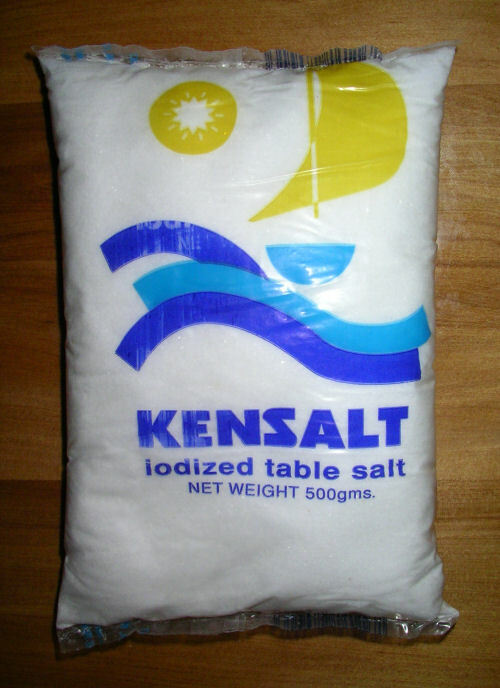 Also, I was wondering why a huge packet of salt sells for only Kshs. 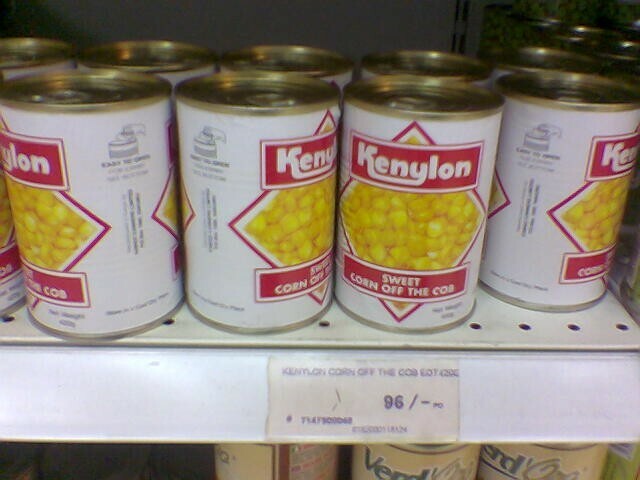 8/= (EUR 0,09) while a tin of (yellow) maize costs 96 /=. This processed food is Made in Kenya and costs EUR 1,12 and the same content costs EUR 0,39 in Europe. MAIZE! Talking of strange products, let me please mention this BIC shaver I found @ Nakumatt. A shaver for dark skin. Hmmm….you know my skin isn’t dark, but the price was good (20 bob) so I went for it and ended up with lots of scars on my throat. I should follow the instructions from time to time. 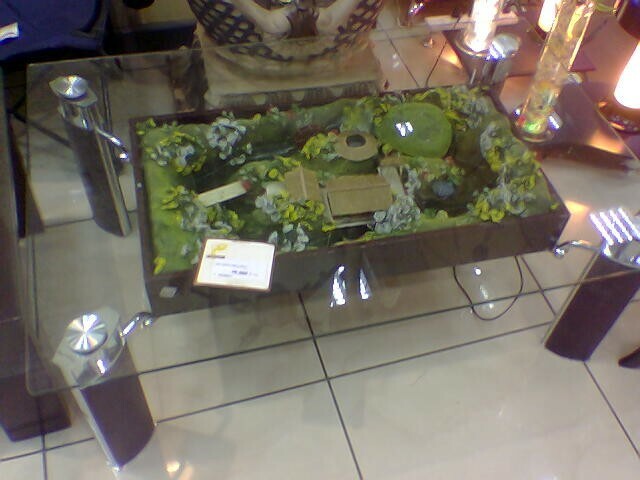 And of course the obligatory (kitsch) Nakumatt curiosity – this time in form of a glass table for the living room with an artifical garden scenery right under the glass. AOB: Link of the Week => Mzalendo, the parliament watch(wo)man’s website, initiated by fellow bloggers Ory & M. Kudos for this great idea and implementation! Brilliant posts Kikuyumoja! Hope you’re enjoying your visit. I guess you’ll be the wide-eyed German speaking dude I run into along Jevanjee? Isn’t the furniture at Nakumatt just atrocious!!! Sometimes when I walk around the furniture section I just want to gag. That table – quadruple gag!! Oh and I hate the way they’re demolishing old buildings and houses all over Nairobi for concrete monoliths. The city is loosing much of its character. Impressive , impressive Juergen. For me being away from Kenya and seeing that the same issue I prolly made noise about 6 years ago still persist saddens me such as the issue of “responsibility”. With your mention about that Karatasi and no one feeling the need to collect it .There is this mentality that as long as “haiko kwa nyumba yangu” then I do not care is so prevalent in Kenya. I know the City council is supposed to take care of cleaning the city but should wananchi just litter trash carelessly just because it is someone else’s job to do so? Jke you are funny ati”your skin is not dark skinned”. 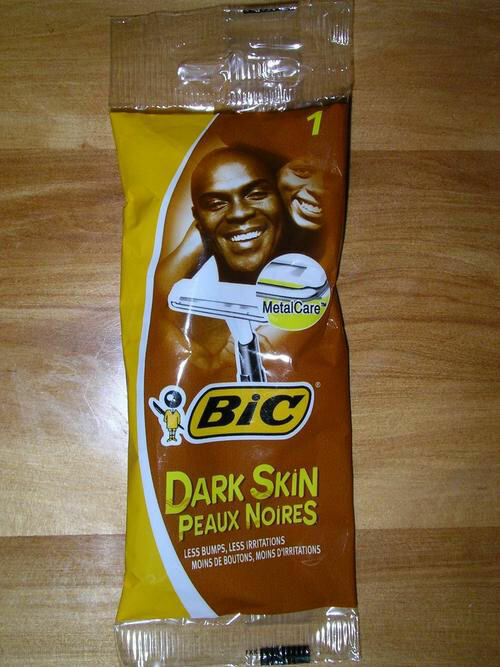 ROFL Pole you are now sidelined from ever getting a Bic Shaver at Nakumatt . You should air your concern to Bic for forgetting that there “other Kenyans” who are not really dark skinned”:-). You asked of where has “harambee gone. Well Kenya is becoming more and more capitalistic society and some of collective responsibility is dying of pole pole. 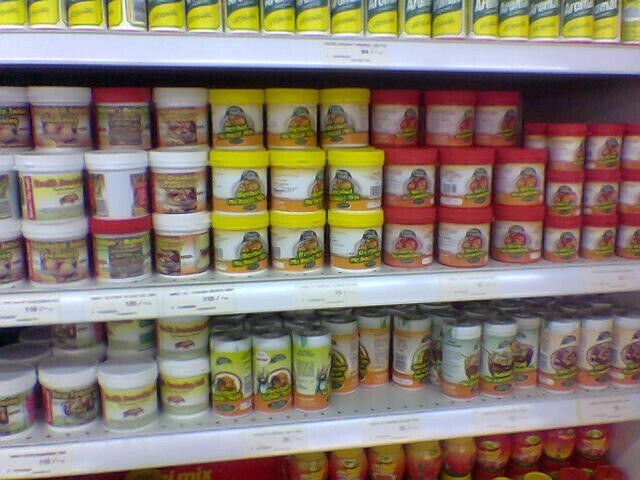 On the artificial stuff in nakumatt, ati who buys such stuff? Haiya , you will be suprised. Hey I’m waiting to see the mushrooms of “Shipped from Dubai” Kiosks in Rivaaa roli(river road) and I hear in Moi Avenue … Weka Picha …..
LOL, at the table. One can only imagine. Nice pics. I forgot what the shelves look like at the stores… I mean supermarkets. Salt still costs Ksh 8/=? That absolutely gives new meaning to “you aren’t poor until you cant afford salt”. I hope no one is eating the damn canned corn. Not while mama Juma has some fresh corn in her kiosk right next to some fresh sukumas and spinach. Oh, the things I took for granted! Request: Please find a man roasting maize with the red chilli and lemon and post a pic. Or anyone frying fish by the roadside in a black karai. Shaver for dark skin . . . what is it meant to shave, skin or hair? It says less bumps and less irritations but says absolutely nothing about cuts and scarring so maybe they know what they are talking about . . .
Nakumatt is a joke indeed, the furniture there is definitely good for a laugh. The worst part though is that the wanna-be crowd are just eating that stuff up. It just goes to show that sometimes you can have more money than sense. Hope you are enjoying your trip. Keep the posts and images coming. Yes, it’s amazing what stuff you can get at Nakumatt. I particularly loved the “dark skin” razor.